NDT/DT Qualification Training - Eurotech Assessment And Certification Services Private Limited. Visual Inspection Test (VT) – Visual testing (VT) is the oldest and most common nondestructive testing (NDT) techniques. It is typically the first step in the examination process to inspect a variety of product forms including castings, forgings, machined components and weld elements . Visual inspection means that the inspector checks the surfaces of welded connections, machined components or materials of varying types after the customer’s needs and wishes. Visual inspection is performed in accordance with specific procedures and acceptance criteria. How important is a visual testing (VT) qualification? Surely someone qualified in NDT can perform visual inspections? Well, ISO 9712 does list VT as a method in its own right. Should all future inspection personnel be encouraged to take a VT course before any other training, as you are advised to look at the item under test before you test it? If you were to attend a VT course you would be trained in the conditions required for VT inspections, the equipment used, including borescopes, endoscopes, etc, and be more aware of how to process images and compensate for missing data or poor conditions. 2. Magnetic Particle Testing (MPT), also referred to as Magnetic Particle Inspection, is a nondestructive examination (NDE) technique used to detect surface and slightly subsurface flaws in most ferromagnetic materials such as iron, nickel, and cobalt, and some of their alloys. Because it does not necessitate the degree of surface preparation required by other nondestructive test methods, conducting MPT is relatively fast and easy. This has made it one of the more commonly utilized NDE techniques. Instruments used in this technique are : Yokes, Prods, Head-shot, Central Conductor, Coil Techniques, Using dry, wet ordinary and wet fluorescent powders, Demagnetization. The duration of each module is 3 days based on ISO 9934- 1 and ISO 1330. 3. 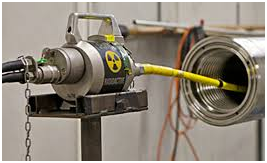 Ultrasonic Test (UT) - Ultrasonic nondestructive testing, also known as ultrasonic NDT or simply UT, is a method of characterizing the thickness or internal structure of a test piece through the use of high frequency sound waves. 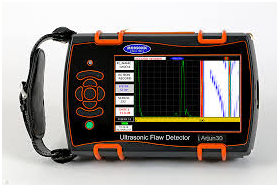 The frequencies, or pitch, used for ultrasonic testing are many times higher than the limit of human hearing, most commonly in the range from 500 KHz to 20 MHz. The duration of each module is 3 days based upon ISO 11666 and ISO 23729. 4. 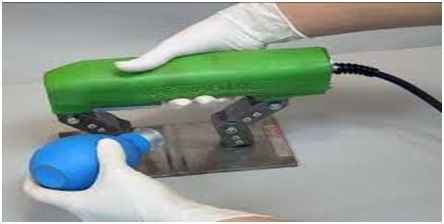 Penetrant Testing (PT) - Dye penetrant inspection, also called liquid penetrate inspection or penetrant testing, is a widely applied and low-cost inspection method used to check surface-breaking defects in all non-porous materials. It is fast, economical and widely used non destructive method to detect surface breaking discontinuities in all non- porous materials. Instruments used in this test are: Cleaner, Penetrant, Developer, UV- A light. The duration of each module is 3 days based upon ISO 23277 and ISO 342. 5. Radiography Test (RT and RTFI) – Duration 5 Days - Radiographic Testing (RT or X-ray or Gamma ray) is a non-destructive testing (NDT) method that examines the volume of a specimen. Radiography (X-ray) uses X-rays and gamma-rays to produce a radiograph of a specimen, showing any changes in thickness, defects (internal and external), and assembly details to ensure optimum quality in your operation. RT usually is suitable for testing welded joints that can be accessed from both sides, with the exception of double-wall signal image techniques used on some pipe. Although this is a slow and expensive NDT method, it is a dependable way to detect porosity, inclusions, cracks, and voids in weld interiors. The duration of each module is 5 days based upon ISO 17636. 6. Bend Test - A bend test is a method for measuring stiffness and yield properties of certain materials. Bend tests for ductility provide a simple way to evaluate the quality of materials by their ability to resist cracking or other surface irregularities during one continuous bend. 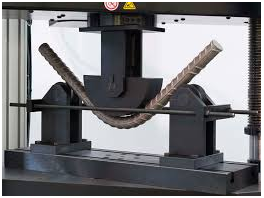 In certain cases the bend test can determine tensile strength. The duration of each module is 3 days based upon ISO 5173. 7. 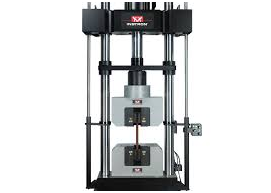 Tensile Tests - A tensile test measures the resistance of a material to a static or slowly applied force. A machined specimen is placed in the testing machine and the load is applied. A strain gauge is used to measure elongation and the stress obtained at the highest applied force is tensile strength. The duration of each module is 3 days based upon ISO 6892 and ISO 15579. Two weeks training of UT,MT,PT, VT, and bend/Tensile Test with minimum four enrolled candidates would be conducted. The course fee of Rs. 30,000/- plus GST @ 18% per candidate for all processes of NDT/DT training would be charged. The duration of the training is for two weeks. In case the student wish to attend only two processes of NDT/DT then Rs 15000 plus GST 18% would be charged. Single process of NDT/DT will not be conducted for any student.